An alternate version of the cover illustration, used inside the CD booklet. Broadway Records created the inaugural Tony Season CD featuring musicals of the 2016-2017 Tony season which they commissioned me to illustrate, and they brought me on once again for the 2017-2018 season compilation as well. All shows opting to participate would have a track on the recording and would be featured in the liner notes. Whereas the inaugural edition was such a hurry-up-and-wait situation, this version afforded us a bit more foreknowledge of what tracks would be included. It also allowed us to play a tiny bit more. I was so grateful to designer Robbie Rozelle for his collaboration. The tangible CD, all design by Robbie Rozelle. Here is the 2017 edition of the seasonal compilation. I was also happy that a synergistic relationship with The Lights of Broadway was welcomed by Van and team. I redesigned the cover composition to create a limited edition card, made available to the first 1,000 folks purchasing a physical copy of the CD. The CD, a couple of pages of liner notes, and commemorative Lights of Broadway card. The oldest annual theatrical award in New York, the Theatre World Awards recognize actors making a significant debut in New York Theatre. Founded in 1944 by Daniel Blum, Norman McDonald, and John Willis, the awards were overseen by Willis until his passing in 2010. The traditions are carried on by a board of directors. I am honored to have been a part of celebrating these achievements since 2011. 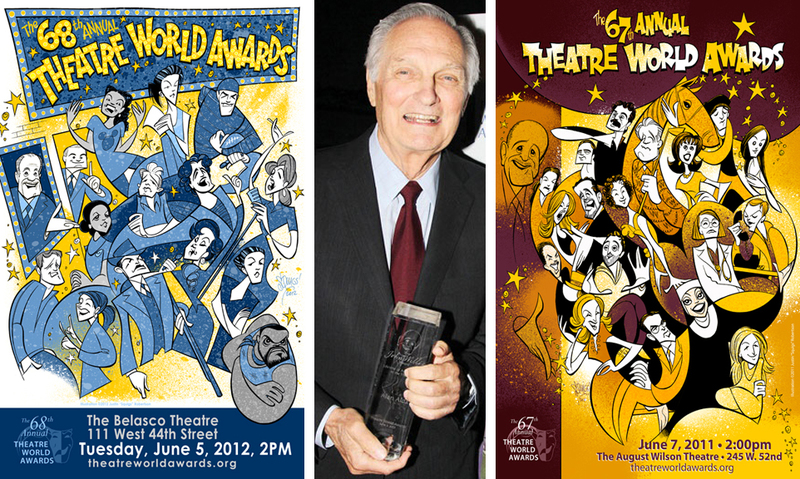 In 2013, the caricature I drew of founder John Willis for the 2011 poster was etched into the inaugural John Willis Lifetime Achievement Award, and presented to Alan Alda. In 2014, the award went to Christopher Plummer, in 2015 it went to Chita Rivera, in 2016 to Bernadette Peters, in 2017 to Glenn Close, and in 2018 to Victor Garber. 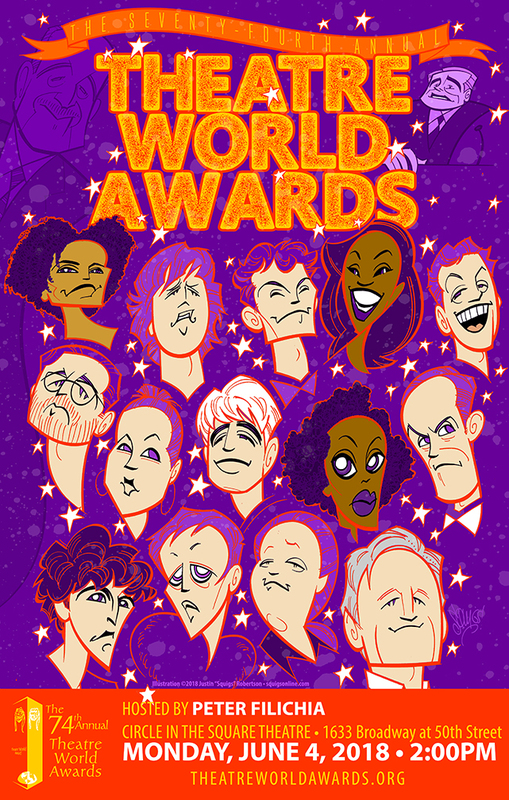 L: The Theatre World Awards poster, 2012. C: Alan Alda with his John Willis Lifetime Achievement Award. R: The Theatre World Awards poster, 2011. In early 2011, I was approached by Actors' Equity (a union to which I belong) to create illustration for the coffee table celebrating the centennial of the union. This of course was and is a great honor. The process took nearly a full year from start to finish, but it was well worth it to be a part of this wonderful project. Pre-layout illustration for the cover of the Actors' Equity Association's centennial celebration coffee table book, Performance of the Century. Squigs with the book. Photo by Jenny Anderson for Broadway.com. BC/EFA, led by Tom Viola and staffed by a multitude of talented and kind folks, does so much good work for so many people, so I was thrilled to be contacted by Danny Whitman and asked to take part in their promotional efforts. Here are some of the results of a happy collaboration over two seasons of events. 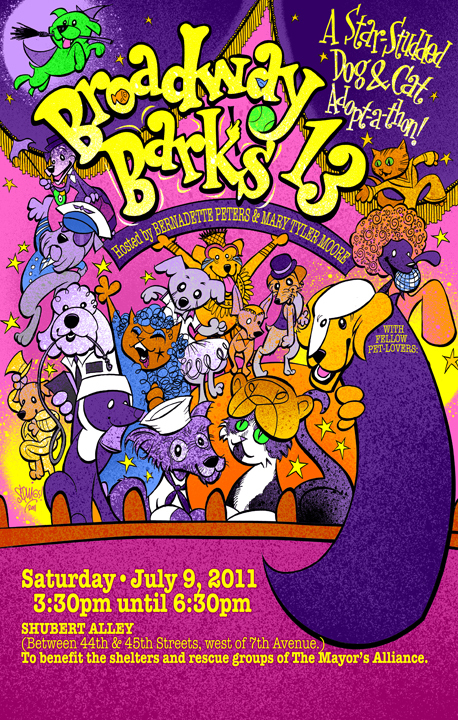 In 2011, when it came time for Bernadette Peters' and Mary Tyler Moore's annual Broadway Barks dog and cat adopt-a-thon, producer Scott Stevens contacted me about the poster. Our collaboration yielded a menagerie of happy pets (caricatures of staff members own four-legged family members) in the costumes of many shows on Broadway that year. L: Production still from NBC's Smash showing the poster below on set. R: Mary Tyler Moore and Bernadette Peters hosting Broadway Barks. This 2012 production starred Danny DeVito and the late Richard Griffiths. 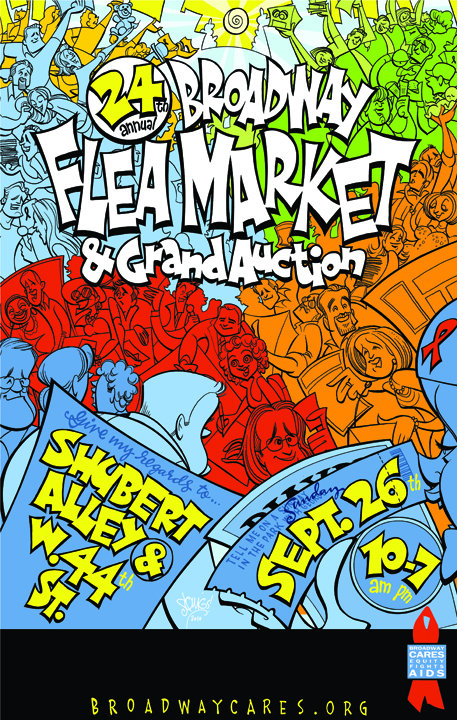 Squigs' illustration was used on the primary poster campaign and a series of web banners and advertisements. The Sunshine Boys poster designed by Chris Loader for AKA/UK, illustration ©2012 Justin "Squigs" Robertson. L: Issue No. 4 of Variety's weekly publication. R: The ad in print. James L. Nederlander and Nick Scandalios. The Nederlander Organization contacted me to illustrate an advertisement in Variety congratulating James L. Nederlander and Nick Scandalios for being named to Variety's Gotham 50, those who are helping to revitalize NYC's rich showbiz legacy. This piece was commissioned by IMG Model Agency for publication in V Magazine but alas went unused. It features many of their top models in a scene inspired by a night at East Village restaurant Indochine. 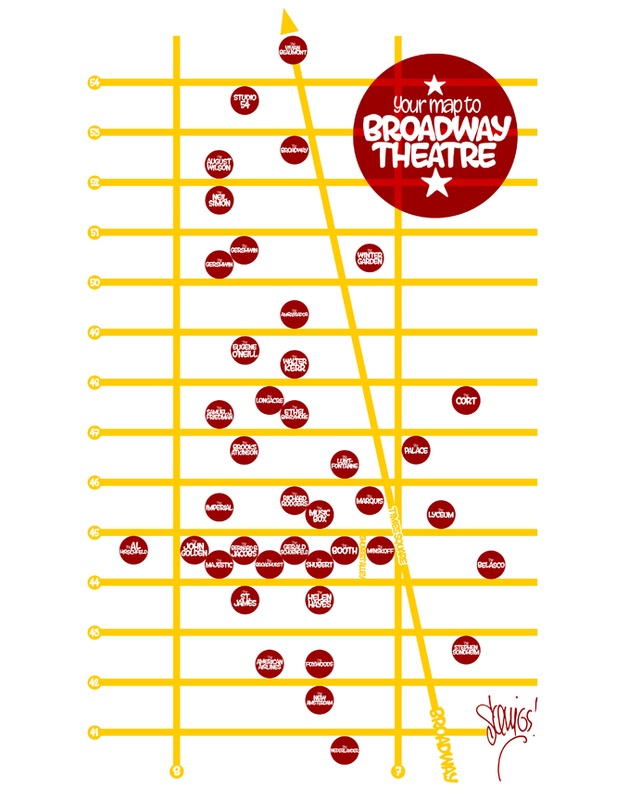 A version of this map was suggested by and appears in Jennifer Ashley Tepper's book series Untold Stories of Broadway. In the book, we added icons for theaters of the past referenced in the book. 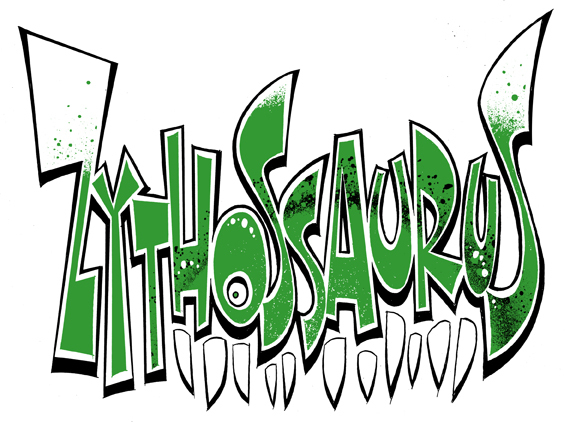 When a project drifts into the realm of graphic design, I often need to create titles in a style that goes hand-in-hand with my illustrations. Here are some examples from various projects.